Thomas Edmund Dewey (March 24, 1902 – March 16, 1971) was an American politician. He served as the 47th Governor of New York from January 1, 1943 through December 31, 1954. He ran for President two times, he lost both of them. 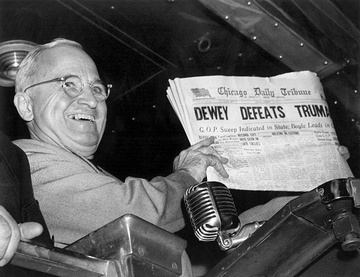 He was mostly known for loosing to Harry S. Truman when the Chicago Tribune mistakenly printed newspapers that he defeated Truman. Dewey was born on March 24, 1902 in Owosso, Michigan. He studied at the University of Michigan and at the Columbian Law School. Dewey was married to Frances Hutt from 1928 until her death 1970. Dewey died while on a trip to Miami, Florida from a heart attack on March 16, 1971, aged 68. Thomas E. Dewey Facts for Kids. Kiddle Encyclopedia.